"How do you solve a problem like Maria?" WESTWARD SHIFT: Computer model trends past 24 hours are depicting a significant westward shift in Maria's track toward North Carolina's Outer Banks. CONE OF UNCERTAINTY: The National Hurricane Center's official track has also moved notably west, from solutions earlier this week that were all out to sea. EXPANDED EFFECTS: A strong and large but slowly weakening tropical system results in an expansion of the wind field. A wider area will experience tropical-storm force winds than if the storm was very strong with a tightly-compacted wind core. 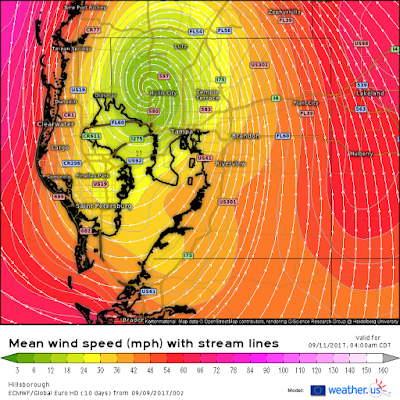 IMPACTS FOR MID-ATLANTIC COAST? Coastal communities from South Carolina to New Jersey will experience 72+ hours of large and increasing swells, persistent onshore easterly winds, water levels rising with each tide cycle and probable flooding in low-lying areas. ATLANTIC WANDERER JOSE, ONCE A CATEGORY 4, now looping in the Bermuda Triangle before expected to turn toward the Southeast coast this weekend. Long range show that a high pressure ridge over E Canada & northeast could move into North Atlantic late next weekend. Ensemble models below largely depict an out to sea solution. Development of a deeper trough in western U.S. same time period could either nudge Jose away from land, or help create a channel with the ridge, driving the storm northwest. We will continue monitoring for indications for / or against this scenario. TAMPA: COULD THIS BE THE ONE? 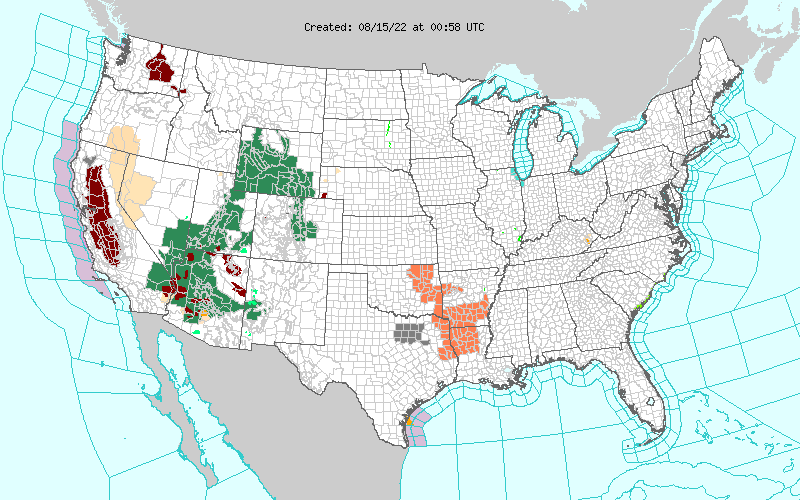 WATCHES & WARNINGS EXTENDED NORTH ON EAST & WEST FL COASTS. MULTI-CITY LANDFALL on Florida's west coast while areas of east and Space coast receive 100 mph winds. 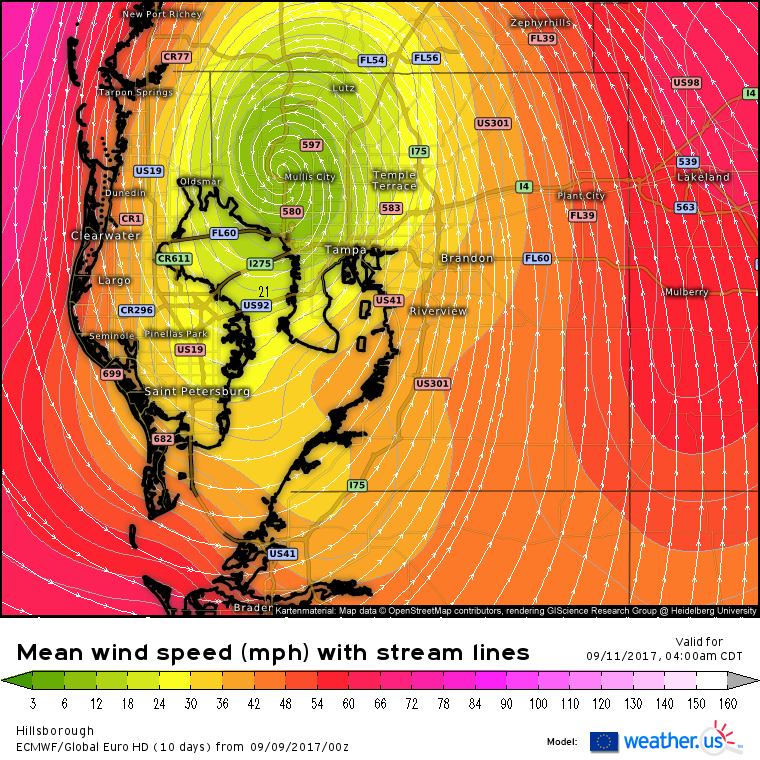 The Nature and Gold coast cities likely to see winds of 100-120 mph include Naples, Fort Myers, Port Charlotte, Sarasota,Tampa-St. Petersburg, Clearwater. 3/ 4 of FLORIDA PENINSULA likely to receive winds 75 mph or greater, per NOAA. FORECAST POSITION: NORTH TAMPA METRO BY 4 AM MONDAY AS CAT 3. 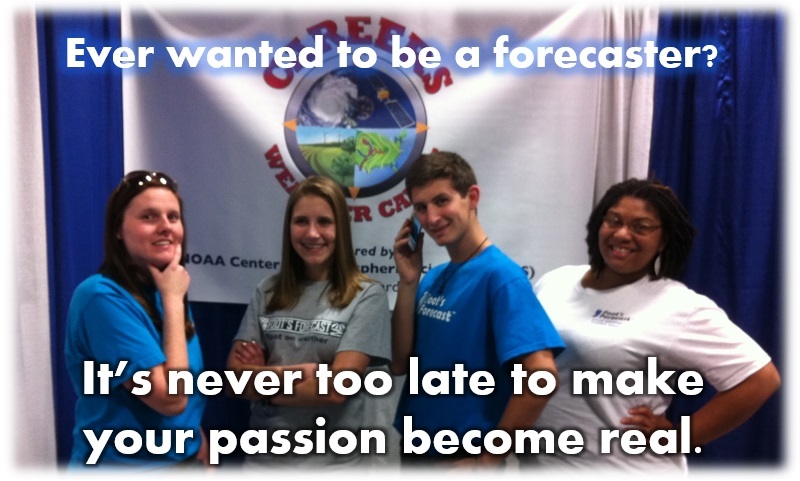 SUMMARY OF OFFICIAL DETAILS: See our Hurricane 411 Center. 6:00 AM ET SAT 9/9 Westward shift in track took place overnight as has been the trend, resembling the scenarios early this week of a west coast landfall as a major Category 4. These impacts would mirror the 1935 Labor Day Hurricane, 1960 Hurricane Donna and Tampa's last major direct hit in 1921 (1-min video) that produced 6-12 feet of surge in the Bay. View Surge Maps for Tampa inundation levels at Category 3, 4 and 5. 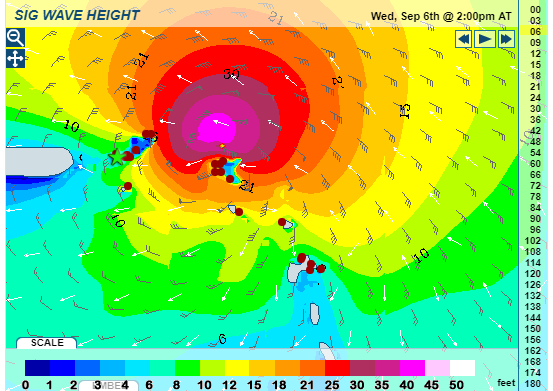 Below is the forecast position for 4 AM Monday 9/11 by the European, of which NHC has indicated their path is mirroring. A docu-drama video scenario developed by the Tampa Bay Catastrophic Plan Project shows how a Category 5 strike would play out were that to occur. Even if not a Cat 5 at landfall, it won't matter. Impacts from this path would essentially be the worse case scenario if the storm restrengthens after leaving Cuba. Previous 175 miles of coastline and interior sections of West Florida will have just experienced a Category 4 storm with damage far exceeding Donna and the 1935 storm. 9:50 PM ET FRI 9/8 If major westward shifts occur in the official track at this point, Tampa-St. Petersburg could be looking at "the one" they've been fearing for years...a Category 3/4 monster with a 12 foot+ storm surge that inundates the entire downtown and leaves St. Petersburg an island. KATIA ONLY 6 MPH AWAY from becoming the THIRD consecutive category 3 or above storm to form just this month! It is direct access to the most important model: Reality. Irma underwent an eyewall replacement cycle Wednesday evening, and appears to have experienced no change in wind speed, indicating it has influenced the atmosphere to the point of creating its own environment. Complete devastation reported on the island of Barbuda, with 90% of structures damaged or destroyed. An anemometer failed at 155 mph before breaking off. NO-WIN FLORIDA: An 18-24 hour path along the Florida East coast, if it is crossed by the western eyewall as a Category 4/5, would produce widespread catastrophic damage equivalent to Hurricane Andrew were it to travel a 200 mile path from Miami to Jacksonsville. "Grazing" or "scraping" the coast with winds of 120-150 mph would not be an appropriate term to describe the immense danger this storm presents. JOSE Status: Winds 50 mph, moving W at 14 mph. PREVIOUS POST: In "All magic comes with a price" are outlined some "think abouts" for those in affected areas to do advance planning or start early preparations. CATEGORY 5 IRMA TUESDAY EVENING, WINDS 185 MPH. THAT'S WINDY. A SHIFT HAS BEGUN. Some models earlier Tuesday and into the evening began shifting the Florida landfall track ideas to eastern side of the state, and several have moved back into the Atlantic. 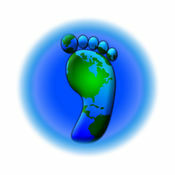 These include the Tue afternoon output of the US Global Forecast System. BIG PLAYERS: The current south/central Florida projected path for late this weekend remains a dominant threat. However, several features including a depression in the Gulf, newly minted Tropical Storm Jose, the Atlantic ridge and the approaching trough from the western U.S. are all influencing the track of Irma. These are among the many reasons behind track fluctuations. STILL IN THE WOODS: Interests in the Carolinas, Virginia, Maryland and the Delmarva should remain on alert and well-informed of additional track changes which may be coming. A number of scenarios have yet to play out which could quickly bring Irma toward the Southeast coast. If the southern edge of the High weakens, or the western trough arrives sooner, or Jose changes forward speed...any of these could introduce an "escape hatch" to the north. This is behind the sharp right turn everyone has been observing sees in the models. Another 36 hours will be telling on which part of the East coast country is at highest risk for impacts or landfall. WHAT WE REALLY THINK? While all eyes and thoughts are on a potentially devastating strike to Florida -- as well remembering the daily suffering after Harvey -- eastward shifts in models and other players are hinting that original track ideas toward the Carolinas and coastal Mid-Atlantic cannot be ruled out. 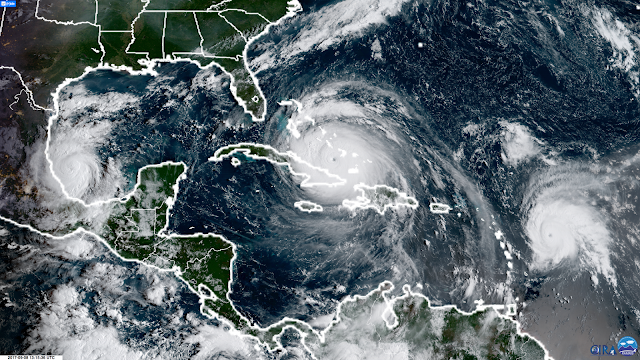 We encourage Emergency Managers from the Carolinas north to Virginia and Maryland remain on an alert footing and avoid thinking a Florida hit eliminates risk. There is no guarantee of any one model track becoming true. "All magic comes with a price." 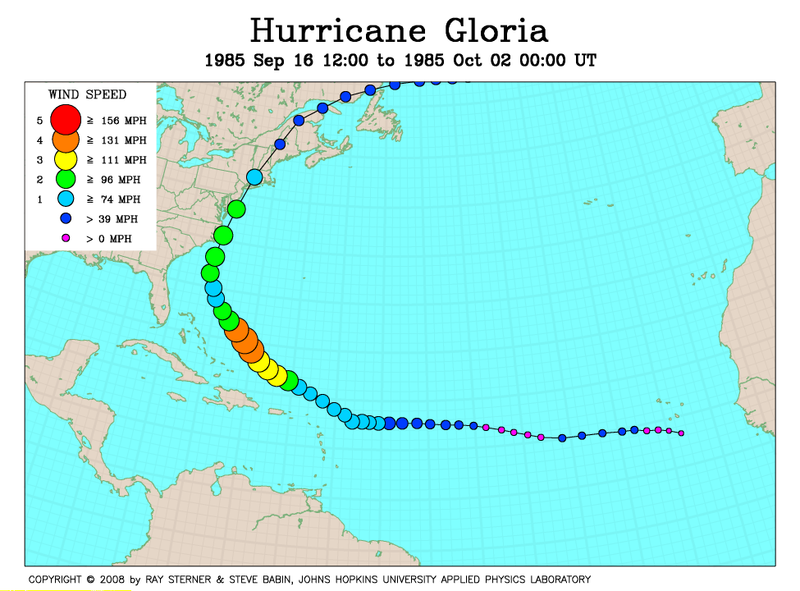 STORM TRACK COMPARISONS resemble major hurricanes CAROL and HAZEL* (1954), GLORIA (1985), HUGO (1989), FLOYD (1999). The last significant hurricane to landfall in the U.S. and traveled Irma's current and projected path was ISABEL (2003). OFFICIAL DETAILS: National Hurricane Center advisories and graphics on Irma. The magic is one can enjoy property near water, if the price of that risk is understood. The risks come down to coastline physics. Some areas are geographically less susceptible to a land-falling hurricane (such as Savannah, GA), while other areas are known to be high risk locations but have a low probability in any one year of a strike (Chesapeake Bay). 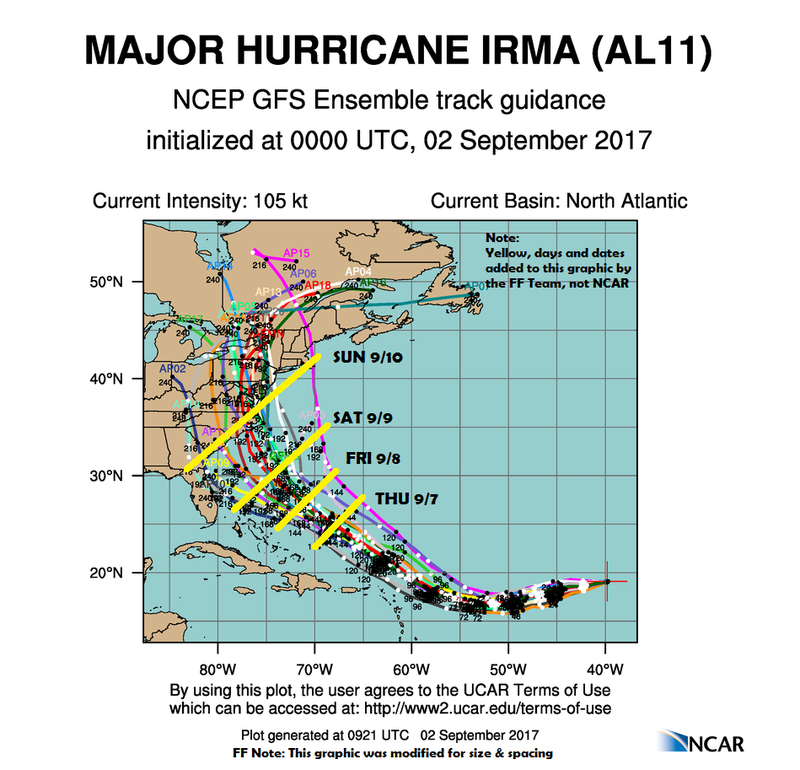 The map below is a general track trend as of Saturday 9/2 by all 20 members of the NOAA-operated Global Forecast System. Each member processes a slightly different set of algorithms, interpreting the existing data in various ways to generate a spread of possibilities. 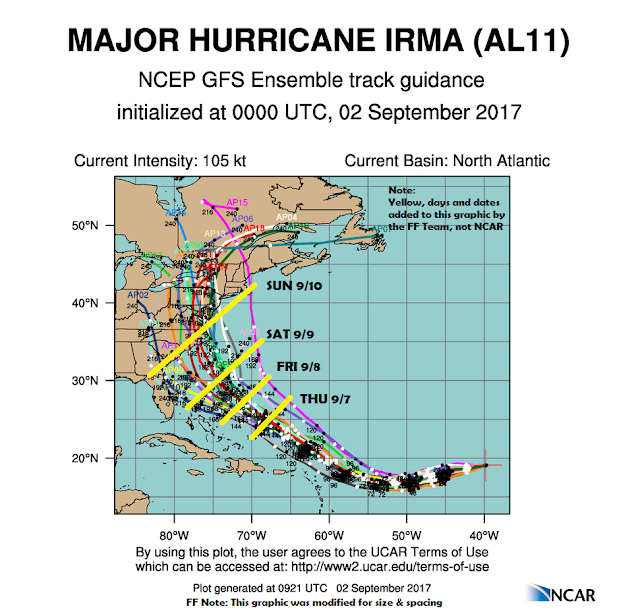 Note that in both maps, the Georgia coast is crossed by only 1 model member, whereas the Carolinas are littered with track options. With this in mind, we offer two general scenarios to evaluate as the week progresses. SCENARIO A: Long range forecasts show a blocking High pressure system may drift into the North Atlantic by later this week, altering the path and resulting in more direct impacts on Florida. This would lessen the risk of effects to the Mid-Atlantic, but the Carolinas and Georgia would remain under threat. SCENARIO B: While the storm is making the SW turn as forecast, it is also traveling more north of that path than expected. This could lessen the threat to Florida, Georgia and South Carolina, but increase the potential for impacts to North Carolina and eventually, the Mid-Atlantic. be observed over time the difference between actual and projected tracks. QUESTIONS? Let us know in the comments on THIS site. We will answer in Q and A format in a separate post on this site. "THINK ABOUTS" for pondering & planning, just in case. In the event plans have to be implemented, advance thinking is always helpful. 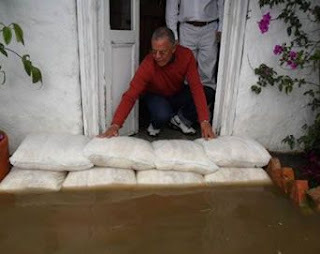 A few sandbags could go a long way, depending on your situation. CHECK YOUR POLICIES on wind damage claims and sewer backup. Talk to your agent. LIVE NEAR WATER? Live through Isabel? What might you do differently the next time? SUPPLIES: If in a flood-prone area, would sand bags help? If so, scope out supplies now. MOVING? We sure hope next weekend isn't move in day. Consider alternate dates if you can. GROCERIES: Are there bulk items you need or always like to have on hand? Avoid being in the big line if a Hurricane Watch was hoisted for your area. DATA PLANS: What if your family all had to go to 4G for hours each day if no Wi-Fi? See what your provider would offer if you had to increase your data plan for 1 month. FURRY FRIENDS: Enough food to provide them for a few weeks? It'll get used either way. MEDICATIONS: Consider getting the 30- or 90-day prescriptions refreshed if they are low. LESSONS FROM SANDY: How are your resiliency plans for critical infrastructure, such as power generators below ground level, rotation & relief schedules for emergency on site staff/essential personnel? Pretend it's Friday, September 8 and a your school district has found itself within the "cone of uncertainty" of the projected paths for early next week. Even though the storm is 1000 miles away, school is in session because effects have not arrived and the storm's final path is not fully known. What preparatory issues would your staff need to consider when leaving the building on Friday if that were to happen? Weather Intelligence. When you need it most. Let's talk about everyone's favorite dinner party topic! who pays for the debris removal, cleanup, renovation and new appliances? INCONVENIENT TRUTH: The biggest misconception about home insurance? Damage from wind-driven water (storm surge) OR rainfall-induced flooding by a hurricane is NOT considered an insurable claim on a traditional homeowner's policy. But why? AGGRAVATING TWIST: The insurance industry states the wind was not the direct cause of water damage you claimed after the hurricane. The twist is that in scientific reality, it did. How is storm surge created? By low pressure and strong winds in the eyewall raising up the sea surface water level underneath the storm. This underscores the confusion: Many homeowners don't understand how storm surge damage can be denied when it actually generated by wind action. The solution: Flood insurance to avoid that argument or heartbreak. IN A FLOOD ZONE, AND DON'T KNOW IT? Even if you know your property is outside the high risk 100-year flood zone (known as Zone AE), it would be wise to determine in which zone it IS located. Perhaps you are BETWEEN the 100-year and 500-year zones? If not sure, learn more at FloodSmart.gov or this link to flood criteria with the National Flood Insurance Program. New flood policies may have a wait period before taking effect. The lessons from Harvey speak loudly about what happens when a homeowner thinks even basic Flood insurance is unnecessary.